Jack R. Van Ens serves as Executive Director of CREATIVE GROWTH INC. 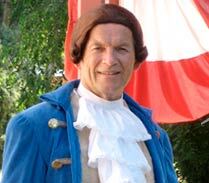 Since 1976 Van Ens has portrayed Thomas Jefferson for schools, religious organizations, libraries and public service groups. 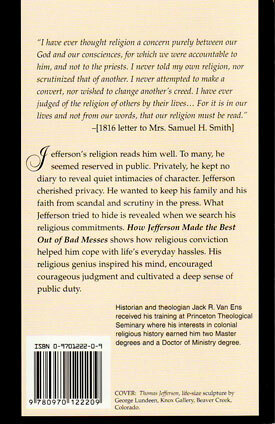 Having two earned Masters degrees (one in U.S. Colonial History) and a Doctorate in Communications from Princeton Theological Seminary, Van Ens has twice been invited as a Visiting Scholar at the International Center for Jefferson Studies at Monticello. 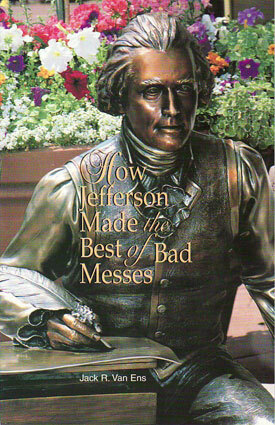 He wrote the book, HOW JEFFERSON MADE THE BEST OF BAD MESSES. He has coordinated for 15 years the Jefferson County Good News Breakfast, bringing together 500+ community leaders to celebrate civic virtue. Van Ens is founding member of the Colorado Civic Canopy, a statewide network of networks fostering civic engagement. Payment checks to: Creative Growth Inc.